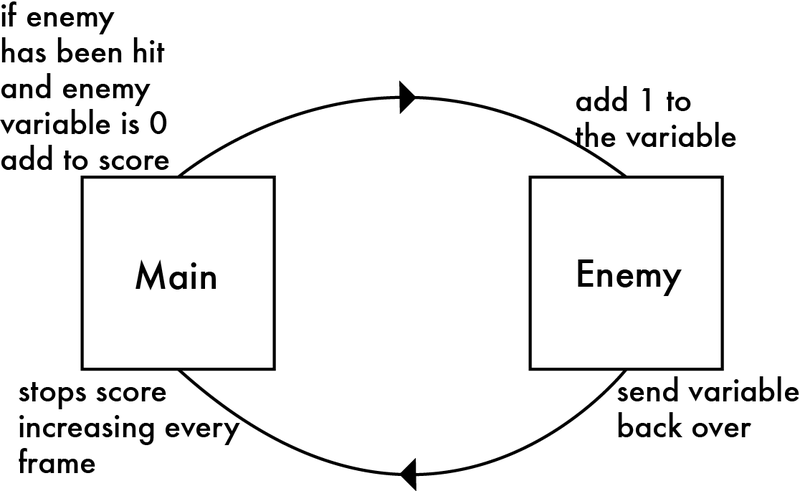 For my own amusement and so I dont have to sit through the intro animation a bajillion times but yet not take it out (it’s integral structure dammit) I’ll put in a skip code. This is a short sequence of button presses that will allow me to skip to the fun stuff and not have to do the setup screen every time. This is a modifcation of the konami key code listener which can be found here. I just changed it so that its the last three keys of the konami code so its quicker for me to enter, yet it cant be accidentally hit. The other code snippet I want to put in my project is a high score list. Surprisingly, there isn’t a tutorial that I could find on making a local highscore table in as3. I could find examples of ones written in as2, online highscore tables, everything but what I wanted. in an array, I could sort the array by the score alone rather than everything. Pretty handy, and exactly what I need. Then I thought about how I would structure this code. I would shove all the scores into an array, and then before showing the table, sort the array and then save that array to the local system. There by having a persistant local high score table. I’ll look at the as2 examples to see how they display the data in a table, but I have a feeling that you just assign a text box with the different entries of the array. So that the first text box at the top would have arrayName and the second one would have arrayName and so on. This should arrange the data in the right order and also update itself every time its called. I’ll be looking at this post to help me understand shared objects, and handily, adobe have posted up all the chapters of AS3 cookbook for free on their site, so I’ll be using that as a reference for the array sorting. I recently read about this really cool hack someone did. The graffiti research lab made eye tracking software and hardware so that a paralyzed graffiti writers could still draw graffiti. 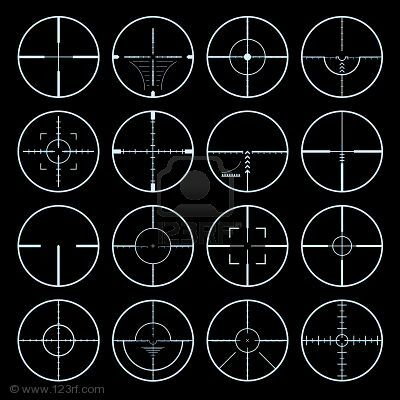 It involves combining cheap parts in a clever way that lets the software track a persons eye movement in a very precise way. The original design featured a pair of glasses as the basis for the eyewriter design. Since that first video, we’ve been hacking on and developing the project, and we have a new design, which we’ve called “eyewriter 2.0” which improves the accuracy of the device, and allow for people who’s heads are moving slightly to also use an eye tracker. The original eyewriter, designed for a paralyzed Graffiti artist TEMPT1, is designed to be worn on a completely motionless head. The 2.0 design, which uses a camera and LED system mounted away from the head, can be used by people whose heads are moving slightly, such as MS patients, and people who wear glasses, etc. This fall, we’ve been showing off and demoing the 2.0 device — check out the eyewriter 2.0 in action — we even hooked it up to a robotic arm, to draw the artwork people make with their eyes. If I only heard about this before I started my project. Who knows? I may even be able to shoe horn this in still. 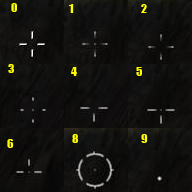 Being able to actually track where someone is looking? how cool is that. By the looks of it though, the persons head has to be pretty still. They say it allows head movement, but since they shoved the persons head in a brace to keep it still, it seems pretty low on tolerance to me. Brain reading AND eye tracking would be one hell of a combo. The reasons why they built this are really nice. It was built purely to help someone else rather than because its cool. It’s also good to see that the thing works in an exhibition style setting with low light levels etc. The whole oroject intrigues me, I like the fact that it’s using body parts that you wouldnt normally associate with interfaces and making them not only work, but work really well. Another issue with this being used for my project is that it would need a camera in front of the users face and this takes away from the whole magic of my project. I want to keep it as magical as possible. Eye tracking would be exceptionally magical yes, but you could see instantly how its done. Hiding a camera thats tracking your eyes may be a bit tricky see. It’s written in OpenFrameworks so I’m guessing it wouldn’t be too hard to get it working in flash. The basic setup for this is actually a small IR cam mounted on an arm on some sunglasses. You flood one eye with IR light and the cam picks up the rest. Could this be built into the hat? Possibly. It has the same flaw that the epoc headset has, you need to calibrate it for each individual user. Not good for quick fun gaming. I have to overcome that in my project really, thats what I have to think about the most in terms of the exhibition. 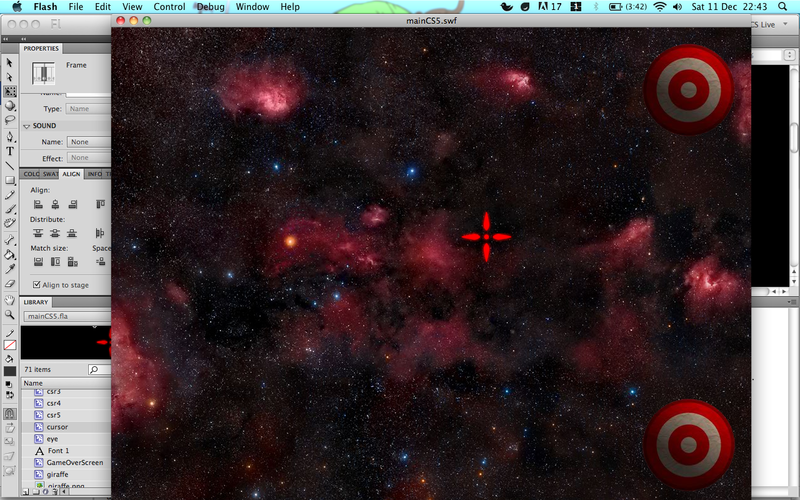 For now a working game with a working base level and boss level is what im going for. When I sent Rich the script, he said he’d be busy for that day but he could get it to me the day after. 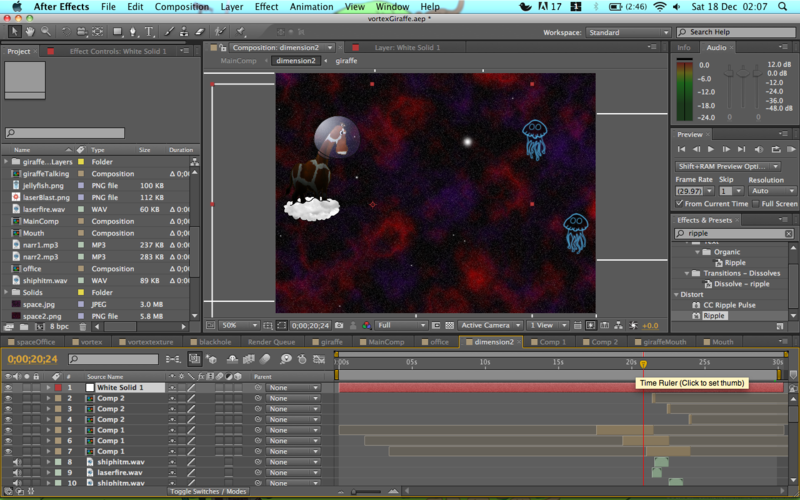 Perfect, that left me some time to start animating the intro sequence. Unlike what every person who animates or does motion graphics suggests that you do, I decided not to do a story board, well, I thought about doing one and then couldn’t think of anything to draw in it so I just made everything up as I went along. This also makes it a bit tricky to explain right now since all my ideas were in my head. I knew what I wanted for Mr Giraffe coming out of his space office to look like, but after that I had no idea whatsoever. What I did instead, was watch some videos. A few years ago, I used to really enjoy the animated films of a guy called Jason Steele, he has a site called filmcow.com, he’s also responsible for the fairly well known Charlie the Unicorn animations. Well, I remembered how his style used to be a mixture of photoshop work and mad cgi effects, so I went back on his site and looked at his new stuff and the effects he used. One of the animations that really struck me was Bino the Elephant. This is a short animation about a mad scientist who sends an elephant to hell, just because. The intro sequence to this just amazed me, the look of the portal to hell, the way the music fit in, how the scientist talked, was scripted and timed, everything was brilliant. So, in the nicest of ways, I decided to homage the portal effect. 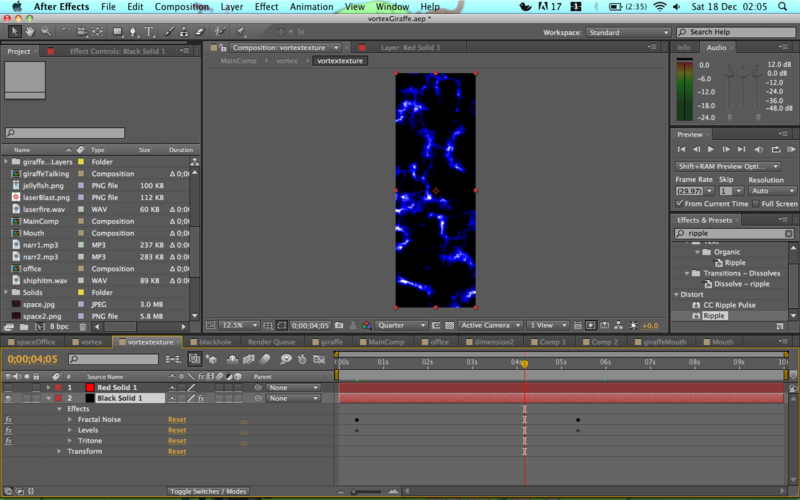 Having never done this kind of after effects work before, I set about learning how to do it. I also set this as a nice learning challenge for me, I get to learn new skills while, hopefully, making something fun. I went on youtube and had a look for some tutorial videos that show you how to make a vortex or portal of some kind, luckily, I found just that. This image is animated using an after effects built in animation method called electric storm I think. It just gives it this cool looking effect. Next I had to map it to the inside of a 3D cylinder (as simple as dragging the create 3D cylinder effect onto the image) and then animate it in 3D. Luckily the tutorial also covered all of this, so by the time I had an animated portal effect that would zoom in slowly. 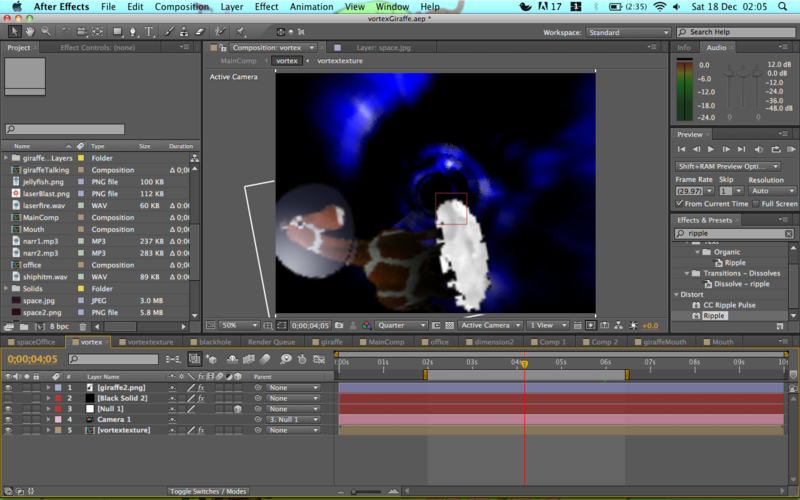 All I had to do was animate in my giraffe falling through the portal. For this part, the giraffe just falling would be fine by itself, but for later on in the animation, I needed the giraffe to bob up and down just as he does in my game. For this I made a composition, which in after effects is exactly the same as a movieclip in flash. A contained animation where you can affect the whole thing at once without having to animate everything inside it separately, if that makes sense. This was simple enough, the way you animate in after effects is actually very similar to flash and kind of close to how you animate in Maya, which, after our sessions with Charlie, I can do basic animation. So having these two knowledge bases let me jump straight in and animate everything I needed to with ease. Next up I made the giraffe coming home from the space office, well not really. 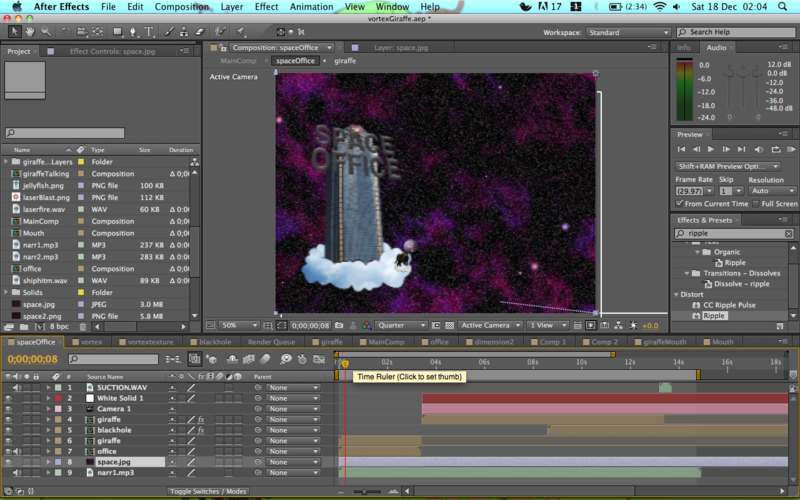 I hadn’t made the image of the space office yet, so I just animated him coming from the top left hand corner to the middle of the screen and made the background move so it looked like he was traveling through space. Again, this was simple enough to do, I made a few keyframes, moved the images around and applied some easing, all great stuff. 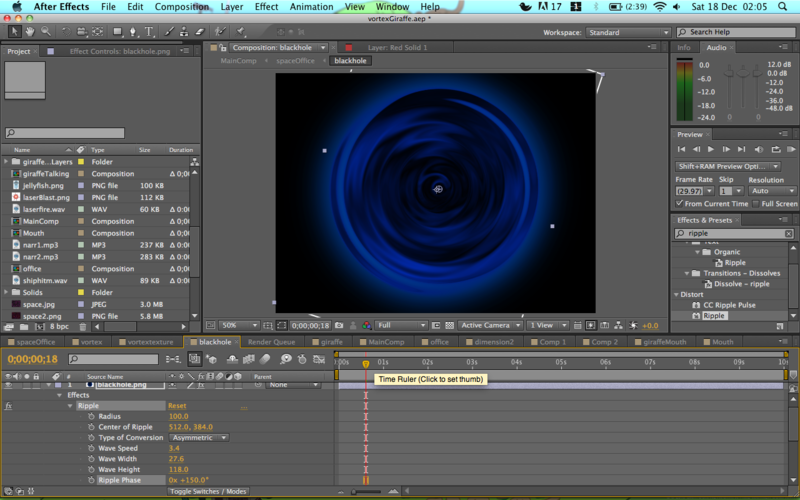 The next part I had to animate was the portal. I made the image of it in photoshop, brought it into after effects and animated it the same way as I did the giraffe, in a composition for easier animating later on. When it’s flat like that, it looks okay, but then when I use a handy dandy tool like the pin corners tool, I could make it look like it was 3D and facing sideways, great stuff. 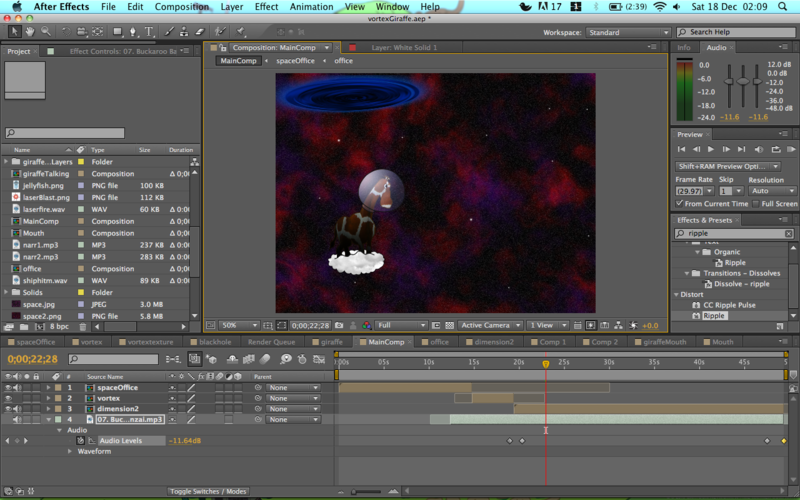 Next I animated the leaving the space office sequence. This was the hardest part to put in just because it needed to be in front of stuff in the timeline that I had already animated. I could have put it in separately as I found out I could later on, but thats all part of the learning fun right? This had a pretty simple effect. I made two images of the space office, one with the lights on and one with them off, I animated them using simple keyframe stuff to make it look like the lights were faulty. 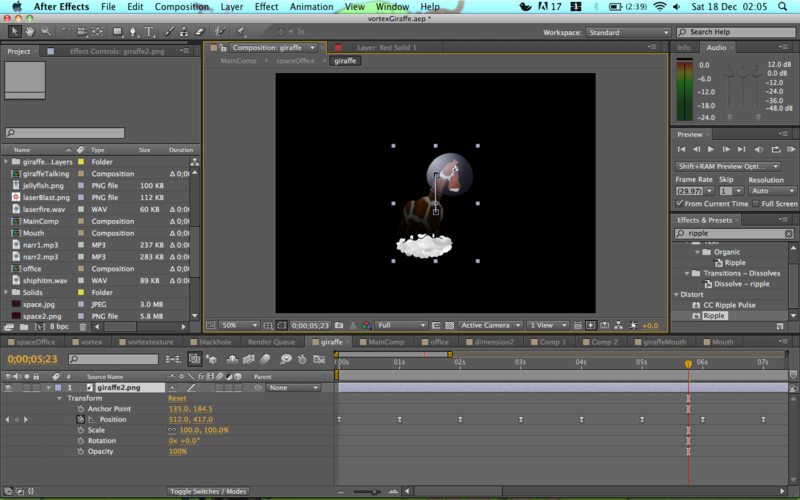 Again, the giraffe was simply animated across the screen using the simple keyframe structure of after effects. Next, I animated the giraffes fight scene. This scene sets you up for how the game is played. Both the narrator and the giraffe explain how his powers can be used and that by concentrating and looking at targets, they explode. 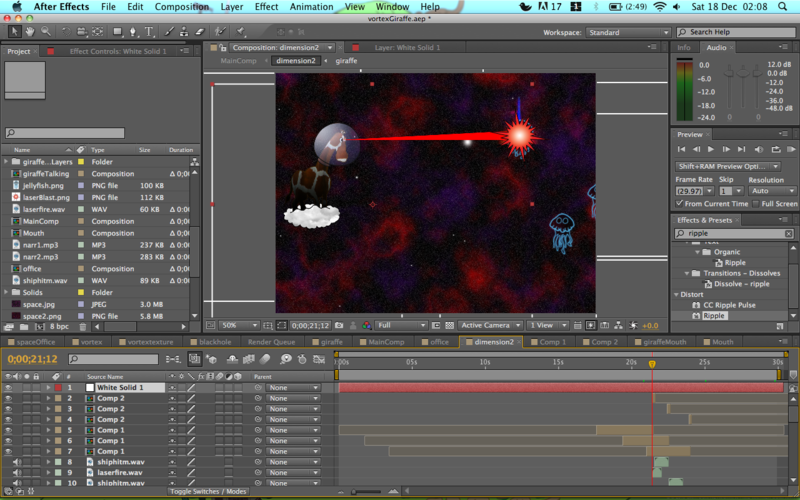 First off I had to animate the enemies. This was simple. I used the ripple effect to make the jellyfishes legs look like they were wobbling away. Nice. I will have to use this effect in the main game. And then, just to finish it off, I decided that the jellyfish would look amazing if they exploded when they were zapped, so I put in a simple, free video clip of an explosion. This is an effect that I will just have to put into the final game as it looks so good. 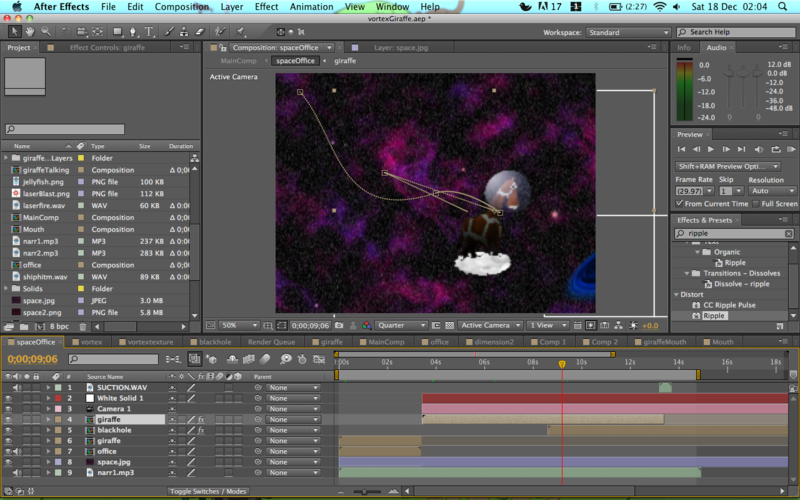 The last part of animating that I had to do was the lip syncing. I’ve attempted lip syncing before many years ago and it is something that I hate doing. It takes aaages to do and is very tedious. Luckily, I googled how to do this in after effects, and there was a way to do it that made things a lot simpler and was just a matter of changing a number on every key frame. Nice, that saved me a lot of time. 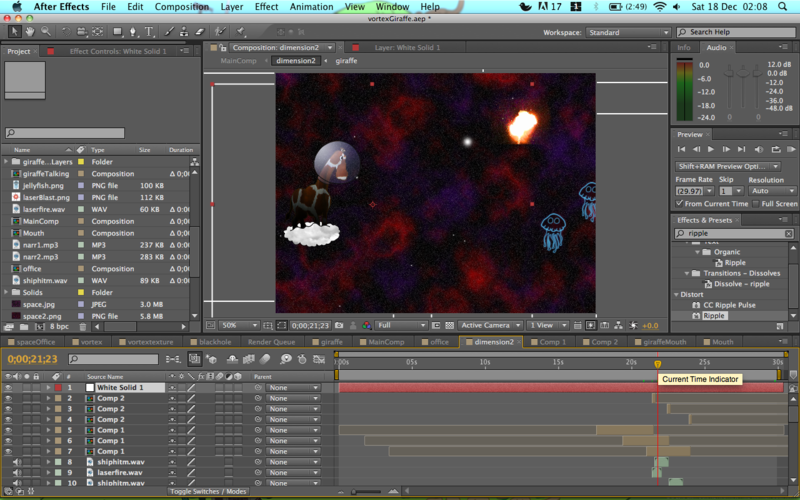 So, by using that method, I animated space giraffes mouth. I could have gotten away with not doing this and giving telekinesis or whatever, but I thought that was a bit of a cop out and that if I put in this animation, it adds to the whole thing and gives it a better, more polished look. Finally, all that was left to do was sequence everything together. This was quite simple actually, just a matter of shoving compositions into a bigger comp. Line them up, add some music and you’re good to go. I’m still not sold on the music yet, that will probably change. But for now, it’s good enough for me. This is what 3 days of animation looks like. 50 seconds of animation. 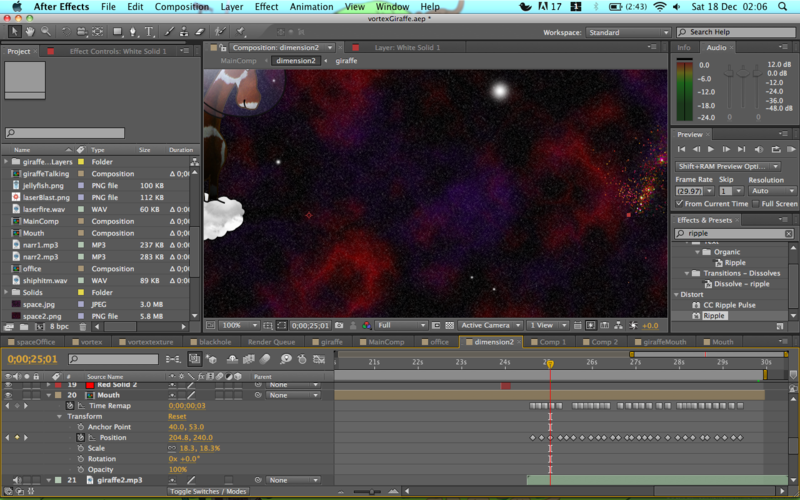 And thats how I went about animating a space giraffe falling through a black hole into another dimension.